Climb your outdoor steps with ease – even in bad weather! Have a set of stairs to access your home, outdoor deck, or backyard? Put your mind at ease with an outdoor stair lift! 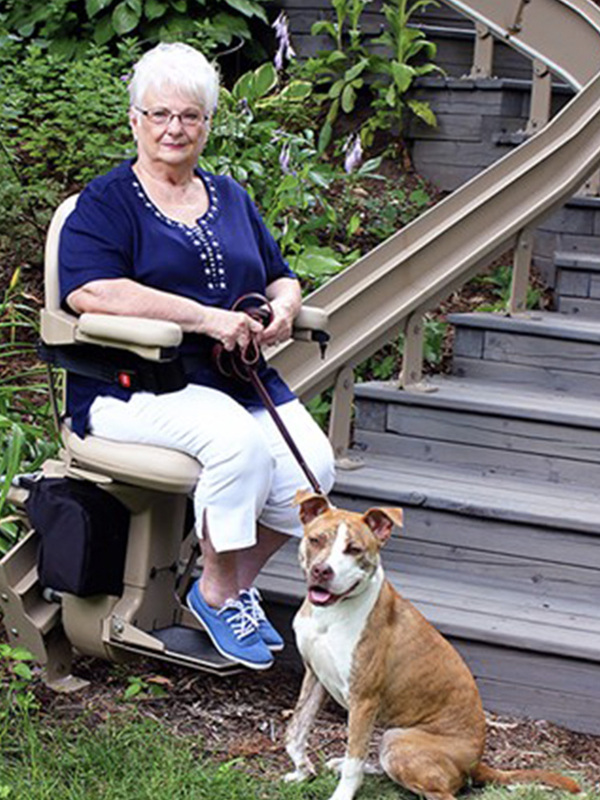 Our outdoor stair lift offers smooth, steady power from a 24-volt DC motor, which will work reliably even in a power failure. With durable outdoor paint, marine-grade vinyl, and weather-resistant seat cover, this is the only stair lift made to be a dedicated outdoor stair lift. It has been performance tested from 0° F – 125° F to ensure it can withstand the harsh New England weather. Have your Freedom When You Invest in a Home Stair Lift. If you think a residential stair lift will allow you to remain safe and independent in your own home, set up a free in-home evaluation and demonstration. We will provide a no-obligation quote. Our installation staff is factory-direct trained and licensed by the State Department of Consumer Protection and the State of Rhode Island Department of Labor. There’s no sales nonsense – just plain facts and great pricing. Discover why more and more people are buying stair lifts from Freedom Lifts, a trustworthy, locally owned and operated company.